Wyoming-based property rights attorney Karen Budd-Falen yesterday acknowledged she is under consideration to become the next director of the Bureau of Land Management but said she has yet to determine if she would want to take the helm of the agency she has clashed with throughout her career. Budd-Falen, who spoke with E&E News from her Cheyenne, Wyo., law office, said she has spoken with Interior Secretary Ryan Zinke about the post, although she does not know when the Trump administration will select a nominee. A spokesman for the Interior Department said this week he did not have any information on potential nominees or the selection process. But while Budd-Falen, who served on the Trump administration's transition team at Interior, acknowledged that she is interested in leading the agency, she added that she is torn about potentially leaving her home state. "I live in Wyoming — where we don't have humidity — and we really like it," she said, referring to her husband, attorney Frank Falen. "We've got a law practice here ... if the president and the secretary of Interior were to ask me to serve, I'd have to seriously, seriously consider that." Budd-Falen, who worked at Interior for three years during the Reagan administration, demurred when asked about her vision for the agency she could lead, saying she has "not really" focused on specifics and that she has not discussed Zinke's plans to reorganize the department. "It's been up in the air," Budd-Falen said, noting that the position requires Senate confirmation. But she did praise the possibility of relocating BLM's headquarters to Denver or another Western city. "I'd really love that because I'm from the West," said Budd-Falen, who grew up as the fifth generation of her family on a ranch in Big Piney, Wyo., and received both her undergraduate and law degrees from the University of Wyoming. Budd-Falen noted that she first met Zinke during the Trump administration transition process, prior to his confirmation as secretary. She has since spoken with him on the phone, but her most recent meeting came during an impromptu run-in at Interior headquarters when she crossed paths with Zinke in a hallway. If chosen as the nominee and confirmed, Budd-Falen would replace acting BLM Director Mike Nedd, who is also considered a contender to fill the post on a permanent basis. 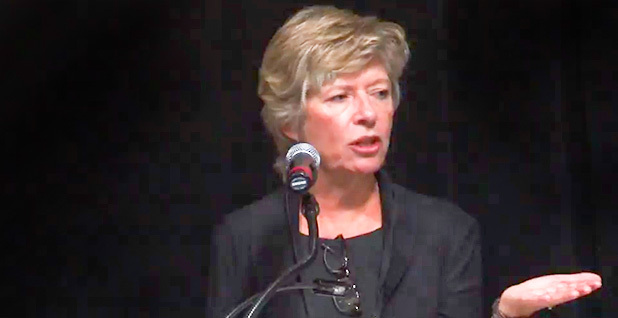 Budd-Falen has clashed repeatedly with BLM during her career, including a case that went to the Supreme Court in which she pursued individual BLM employees under an anti-racketeering law normally used against organized crime syndicates. But she said her potential tenure would be guided by Zinke's vision for the agency. "Whoever would get BLM director, that is their marching orders," she said, referring to Zinke's repeated pledges not to reduce the size of the federal estate by selling or otherwise disposing of public lands. But that view sits at odds with Budd-Falen's longtime criticism of BLM and her pushes for major changes to federal land control, including work that made her a hero of the Sagebrush Rebellion. Budd-Falen has often described herself in public speeches and interviews as a "cowboy lawyer" — she has challenged grazing regulations and endangered species protections, and in a landmark case attempted to sue individual BLM employees under the Racketeer Influenced and Corrupt Organizations Act, or RICO (E&E Daily, June 16, 2017). The Supreme Court ultimately rejected that effort. "I understand the frustration that's out there," she said in a speech at the Public Lands Summit of the West held in Las Vegas in spring 2016. But while Budd-Falen helped to draft a series of ordinances in Catron County, N.M., in the early 1990s that sought to supersede federal authority on public lands, including ordering the arrest of federal agents who violated the civil or property rights of residents, she now reminds local governments that the federal government cannot be forced to follow local laws. "Whether you like the Supreme Court or not, we gotta follow what that court says," Budd-Falen said at the PLSW event, organized by Washington County, Utah. She advocates that local governments develop land-use plans — which she said can be used to force reviews for consistency under the National Environmental Policy Act and the Federal Land Policy and Management Act (FLPMA) — but reminds them that such guides can't supersede federal authority. "Your land-use plan can't argue for a violation of federal law," she said at the 2016 event. "You're not requiring the federal government to follow local law." During that same event, Budd-Falen recalled a story about her father's work to oppose FLPMA's adoption because of his concern about shifting BLM's focus. She said that years after her father's efforts failed, Wyoming Sen. Clifford Hansen (R) apologized to him when the two bumped into each other at a Laramie restaurant. "Sen. Hansen said that they were led to believe that the shift in mindset from disposal [of land] to retention was not going to be a big deal. And Sen. Hansen said it has turned out to be a much bigger deal than any of us had thought," Budd-Falen recalled. But she said that if nominated to lead BLM, she would follow the statute and others that govern the agency. "I think you can't pretend that Congress didn't act when it clearly acted," she said this week. "And that's true with any federal statute." Budd-Falen's career working with ranchers also means she has crossed paths with one of the West's most infamous individuals: Nevada rancher Cliven Bundy, whose refusal to pay grazing fees to the federal government sparked a 2014 armed standoff with federal agents when BLM attempted to seize his cattle over more than $1 million in unpaid fees and fines. He is set to face trial next week over the clash. But the Wyoming attorney's work occurred before Bundy's current battle with the federal government, beginning shortly after the Mojave population of the desert tortoise was designated as an endangered species in the late 1980s. "I was hired by a group of ranchers because the BLM had issued a full force and effective decision to take the ranchers off the [grazing] allotment," Budd-Falen recalled, noting that the group included Bundy. While Budd-Falen won an appeal for the ranchers to continue using the land to graze that season, the permits were ephemeral, allowing BLM to again stop grazing in the area the following year. She noted, however, that the ranchers did not appeal that decision, since many were involved in helping to create Clark County's habitat conservation plan, which included funds for the purchase or trade of grazing allotments. "A lot of the ranchers could see the writing on the wall," Budd-Falen recalled. "They weren't being forced into selling or trading or doing whatever. That this was legitimately an arm's-length transaction." Budd-Falen added that Bundy, however, did not participate in those plans. "I have not talked to him since," she said. In an interview with Tri-State Livestock News in May 2014, Budd-Falen said she was not in touch with Bundy in the early 1990s when he decided to stop paying his grazing fees to the federal government. That decision would lead to a series of fines on Bundy's cattle. "I think that is breaking the law," Budd-Falen told the publication. She also criticized his assertion that the federal government cannot own public lands. "While I have absolutely read the Constitution and understand that the Constitution requires the federal government to own only military and post offices, saying 'I'm standing only on the Constitution' ignores 200 years of court precedent," she said. Still, Budd-Falen criticized BLM for its decision to send armed law enforcement to round up Bundy's cattle. "The BLM had lots of other options, starting 15 years ago when he quit paying his grazing fees," she said at the time. "Everyone was armed. To have such a show of almost military force I don't think is called for under the law, either. There wasn't any reason for the BLM to think, 'If we just bring a big enough army, he's not going to do anything.' For the BLM to turn this into some sort of military operation is totally outrageous and completely unnecessary." In an interview in April 2014 with the conservative website The Daily Caller, Budd-Falen also criticized the federal government for removing grazing in the area to protect the tortoise. "The Cliven Bundy situation goes to show how American citizens react when a government has so expanded that it believes that the citizens are subservient to political power," Budd-Falen told the publication. Environmentalists have already vowed to oppose Budd-Falen's potential nomination and are likely to highlight her past connection to Bundy. "Everyone is entitled to due process, but the fact that she was Bundy's lawyer underscores the fact that she harbors extremely hostile views toward public lands," said Kate Kelly, the Center for American Progress' public lands director. "For an Interior secretary who claims to be against the sell-off of public lands, this would be an incredibly bad choice for Zinke to put at the helm of the BLM," Kelly said.